Chancellor Angela Merkel on Tuesday insisted Germany will not cut foreign aid to raise military spending, rejecting US criticism of its defence outlays. She said "we will continue our effort" in terms of raising defence spending, "but not at the expense of development aid". 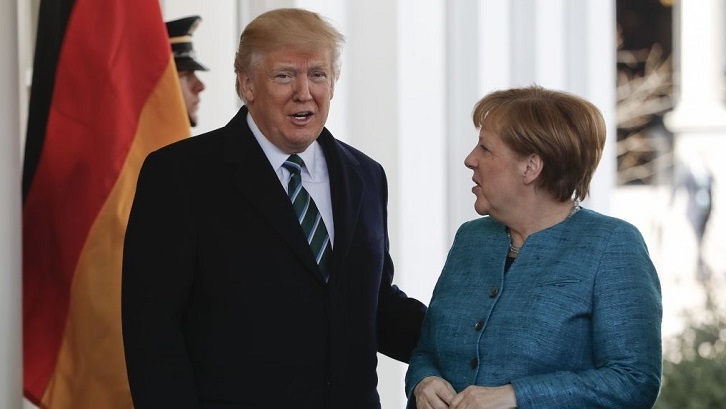 The United States had Tuesday labelled as "worrisome" budget plans by NATO ally Germany that project a fall in military spending in coming years. President Donald Trump has repeatedly accused the biggest EU economy of freeloading on US military might with defence spending far below the NATO member target of two percent of GDP. Germany's finance ministry had Monday presented its budget planning for coming years, which signalled a drop. It said defence spending would first rise to 1.37 percent of gross domestic product in 2020 but then likely fall back to 1.25 percent by 2023. US Ambassador Richard Grenell -- who has criticised Germany on issues from its Iran policy to proposals to use telecom equipment by China's Huawei -- was quick to comment on the projection. "NATO members clearly pledged to move towards, not away from, two percent by 2024," he said, referring to a goal set at a 2014 alliance summit. "That the German government would even be considering reducing its already unacceptable commitments to military readiness is a worrisome signal to Germany's 28 NATO Allies." Grenell's latest reprimand sparked anger in Berlin. A senior lawmaker of the Social Democrats, Carsten Schneider, labelled Grenell a "total diplomatic failure" and the liberal FDP party's Wolfgang Kubicki even demanded the envoy be expelled. Merkel, speaking more diplomatically at a Berlin conference, pushed back against the criticism by arguing that Germany was as focused on foreign aid as on military spending. "We have always said that we're headed in the direction of two percent, and that by 2024 we will reach 1.5 percent," she said. "I can understand that this is not enough for the American president, it's not enough for many European allies," she conceded, speaking at the Global Solutions Summit in Berlin. But Merkel stressed that Germany had already raised military spending as a proportion of GDP despite a growing economy, and that future spending will likely be higher than current projections. While German defence spending went up from $45 billion to $50 billion last year, the growing economy meant the figure relative to GDP stayed flat at 1.23 percent. Merkel also pointed out that Germany is one of the biggest donors to help Syrian refugees, and one of the largest recipients of Syrians seeking safe haven -- which, she noted, Trump had also criticised. Trump's regular outbursts about European defence expenditure have caused some to question the future of the alliance, which celebrates its 70th anniversary this year. US military spending dwarfs that of the rest of the alliance. In 2018 Washington spent nearly $700 billion on defence, compared with just $280 billion for all the European NATO allies combined.